I would like to start out with a big thanks to everyone who voted and to the CVR board members for all their time devoted in keeping this club running smoothly. This journey began for me as a child, when visiting grandma one summer she gave a 5 gallon aquarium with an old bubble filter. From that moment on I’ve been hooked. I’ve kept fresh water aquariums for years then eventually moved over to salt water as most of us do. My first reef aquarium was a 30 gallon aquarium and oh my, what a disaster that was, everything that could have gone wrong, went wrong. It was a bit discouraging but I learned a lot with that tank. Since then I’ve had multiple reefs that I set up through the years. I went from a 55g to a 135g then to a 240g cube, then a 75g to a 45g cube that is now my frag tank. Tank sits on a custom stand. This was another great project and a fun building experience. Tank is lit with all LED 3 AI Vega colors and 2 AI Sol blues that are ran for 10 hrs a day. Lights are fully programmed with the Aqua Illumination controller. Originally started the system with a Cad light 1220 and current skimmer I’m running is the ATB 840 that thing is a beast!!! Skimmer/ heaters are sitting in a Trigger sump. I also have an ATS that hasn’t been fired up yet in till I see the need. Water is being pushed by two 150 Gyre’s one on each side of the tank and two MP40s against the back wall. Combined all four pumps make an awesome random flow patterns. Recirculation from sump to tank is being driving by a reef flow dart. I do weekly water changes, Change out socks with water change. I test maybe once a month give or take. I dose daily with 2 part and use Acropower every other day. Clean glass every 3 days. Warning I am highly addicted to SPS! I also have various Torches, frogspawns, Scolys, Acans, zoas and palys. I would love to add more fish but my Purple Tang is a major bully! Last edited by archaic37; 07-03-2015 at 08:45 PM. Editors notes/ comments: Louie has quite the collection of high end SPS and his tank is truly one of the nicest I have had the pleasure of seeing and photographing. His rock work is amazing and really gives you the feel that you are on the reef out in the wild. 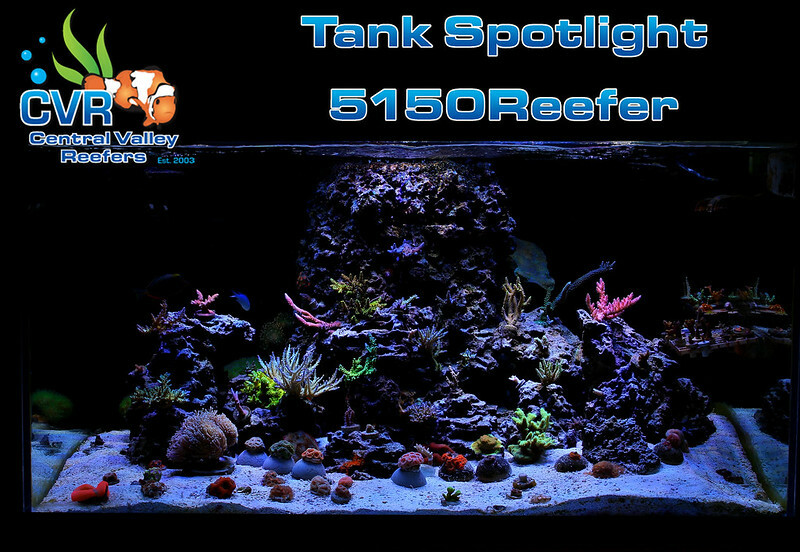 Please join me in congratulating him on being our tank spotlight winner for Q2 2015! Last edited by alexander; 07-02-2015 at 01:56 PM. clean tank! How are you liking the dual gyres? Kevin, I'm loving the gyres. I have them both set on pulse but one is pulsing slightly faster then the other. The current crashes in different parts of the tank creating random waves that I think are freaking awesome. Tank(s): 150g mixed reef and a 45 frag tank. Congratulations, I had the pleasure of seeing this tank in person, awesome! I can't wait to see this tank grown in. Clean build! Nice, I've thought about putting rock work against the wall a few times by using Emaco to make a flat surface on one side. However, even with an almost completely flat surface on the backside, I'm still afraid of trapping detritus and/or getting an algae bloom back there on such a large structure. If I started having issues with my tank and the source was behind the wall I would have a hard time figuring out the problem. Has this ever been an issue for you? How is the rock wall attached? Yeah it definitely collects but I left a few holes in to blow it out....I learned from my last wall lol, it's hard to tell in the picture but there's a tunnel I left around the whole bottom section for the fish,crabs, snails to go for cover and forage, I think this helps out as well. Ok good to know, I'll keep that in mind and maybe try the wall effect sometime. I did a search to see who was dosing with two part and your thread came up. You have a solid tank my friend. I've never seen those gyre power heads and did some research on them after seeing them in your tank, they look nice. Are you still enjoying them? Do you have them dialed down or are you running them full bore? I'm putting up a 75g and think I might look into the x130 for it. Also, are you using dosing pumps, if so what kind? Your tank looks amazing. It has been 7 months, any chance of a updated full tank shot? Thanks Dave, I have then running at about 50% and these things are beasts. I like the amount of area they cover, my tank is 30" front to back and I have no dead spots in the tank. cleaning them is pretty easy as well which gives it another plus for me. I think the 130's would be good for a 75 .